Last Saturday we had a group of friends over for dinner. A typical expat mix of wonderful warm and funny people with various different backgrounds, as in nationalities, but also food preferences. 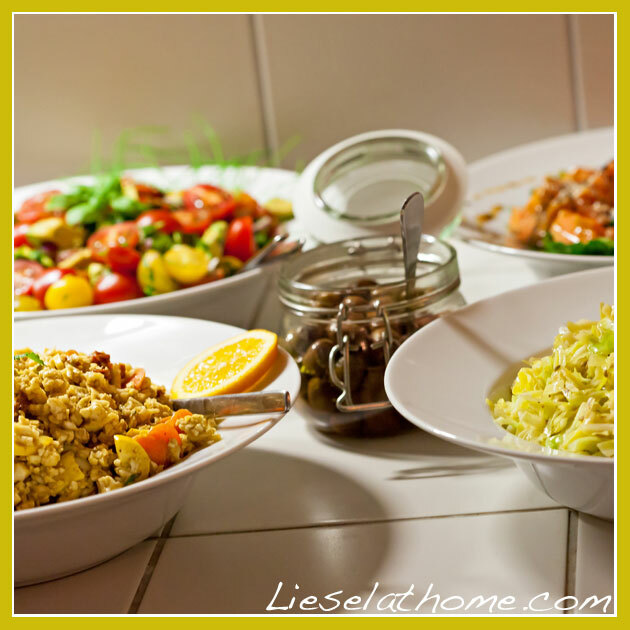 We had everything from no pork eaters, vegetarian, the pregnant one, no wheat – to a raw food vegan. I wanted to cook so that everyone felt included, which took a bit of planning. In the end – the food was loved, and the evening was filled with funny stories, laughter and discussions. Here, I want to share with you the recipes for the food and the snacks I prepared. I also decided to use zero milk products with one exception – the cupcakes. I used my zucchini meatflat recipe, added more spices than usually and got help from my husband to roll them all round. 3 kg ground beef for 17 people – and we had plenty left over. 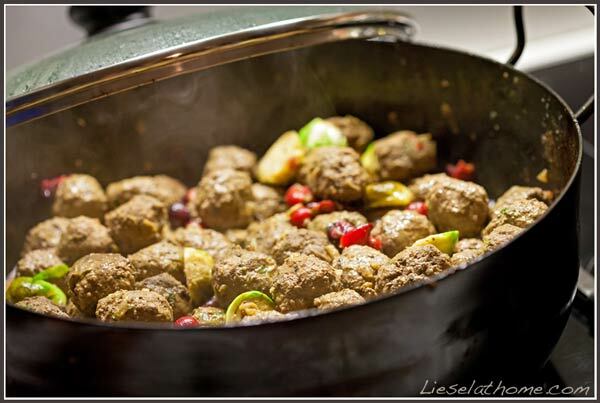 We fried the meatballs in the evening before the party, and just heated them up in coconut milk mixed with tamarind, tomato puree and salt, half an hour before the guests arrived. I like to add (halved) Brussels sprouts and cranberries for a bit of color. 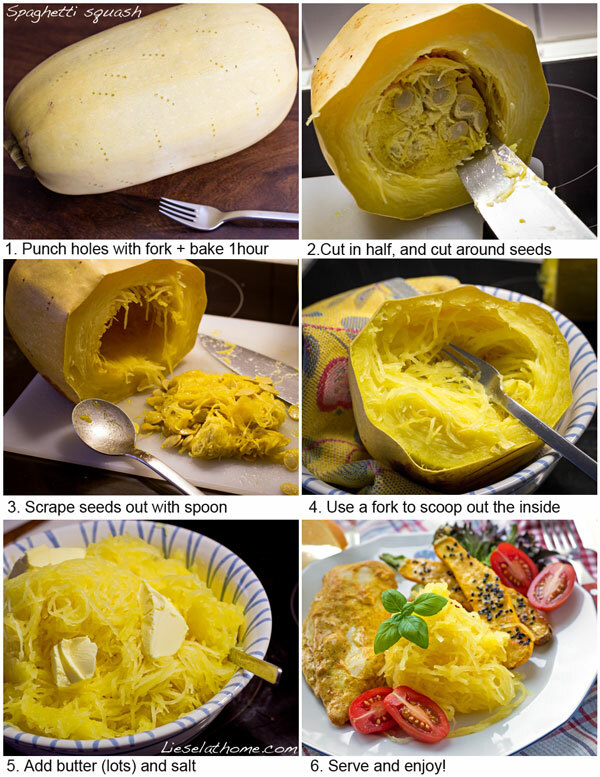 I posted this picture a while back on Facebook as a guide on how to prepare spaghetti squash. For the dinner (17 people) I had 2 squashes and we actually had left overs even though people were taking seconds of it! This needs to be prepared at least a few hours in advance but preferable the day before. Cut cauliflower into tiny pieces. Mix with zucchini (I had yellow), carrot slices, dried tomatoes and finely chopped onions. 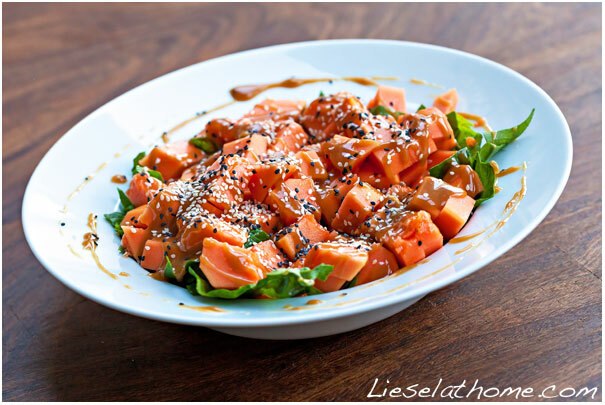 Make a dressing of 1 part olive oil, 1 part almond butter and 1/2 part balsamic vinegar, adding in salt, turmeric, chilli powder, paprika powder, cinnamon and ground clove – to taste. Leave for a few hours, stir every now and then and serve – possibly decorated with a few orange slices. 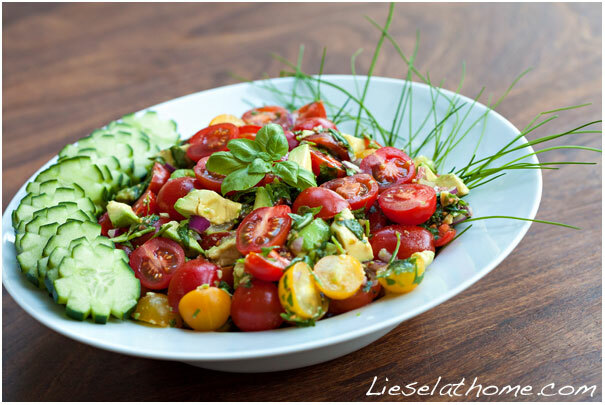 This is Arugula / rocket salad / rucola – what ever you prefer to call it – mixed with cherry tomatoes, avocado and fresh herbs (chives, basil and lemon balm – go all in and use a lot of each!). Dressing made with (1 part) olive oil, (1/2 part) balsamic vinegar and salt. Decorated with cucumber and chives. Again this one needs to be made a day in advance to really soak up the dressing. Simply slice white cabbage (cabbage spitz – Spitzkohl in German – is to prefer because of milder taste – this is the pointy shaped one). 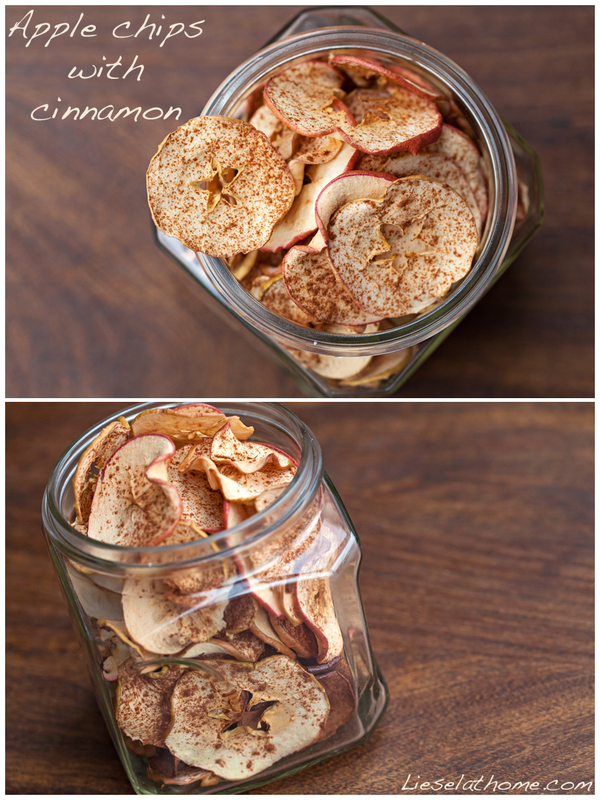 Mix with a dressing of 1 part olive oil and one part apple cider vinegar. Add salt, fresh ground pepper and (whole) fennel seeds. 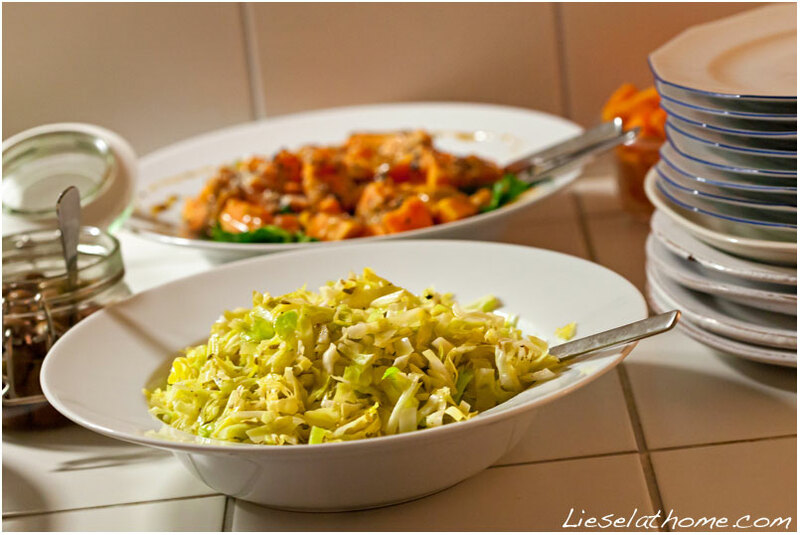 For a large piece of cabbage I use about 2 tbsp olive oil and 2 tbsp apple cider vinegar – just to give you an idea. Date and chocolate truffles and cupcakes – muffins made by THIS recipe and topping as described HERE. 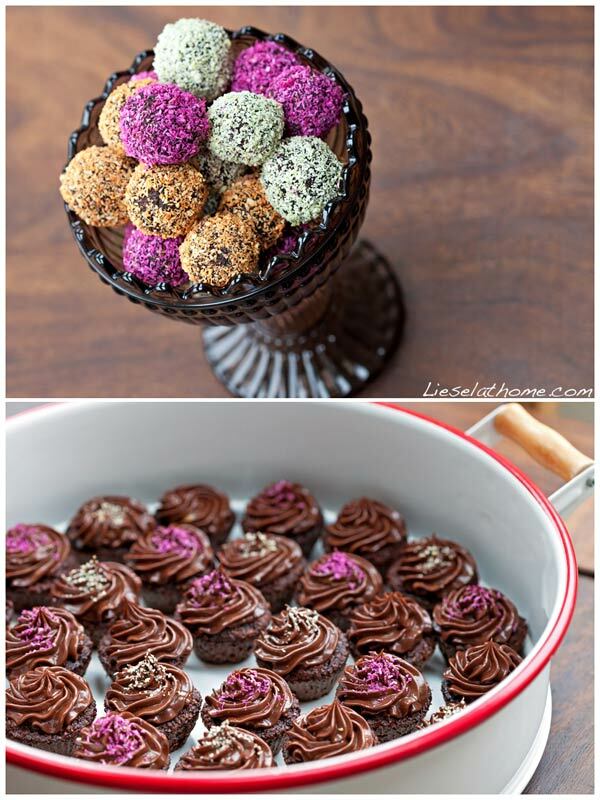 Instructions for colorful coconut sprinkles, that really gives a nice touch, can be found HERE. 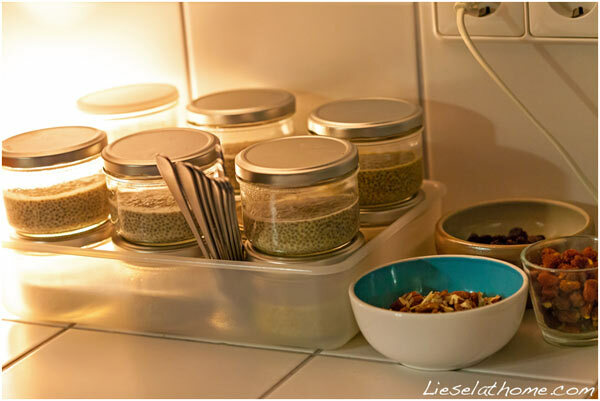 I had made a bunch of small portions with spicey chia seed puddings as well (the one int he end), and served those with nuts and dried berries (Physalis and raisins). This led to quite interesting conversations. A new food to try, and a weird taste experience for some. 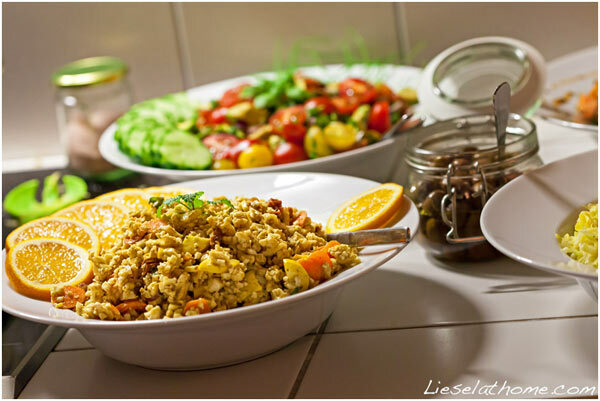 I also had bowls of Physalis, jugs with home made apple chips (basically just sprinkle apple slices with cinnamon and let them slowly dry on low heat in the oven over several hours) and also bowls with nuts, dried berries, coconut and sun dried cocoa beans. For drinks we had red and white wine, beers and plenty of homemade ice tea. 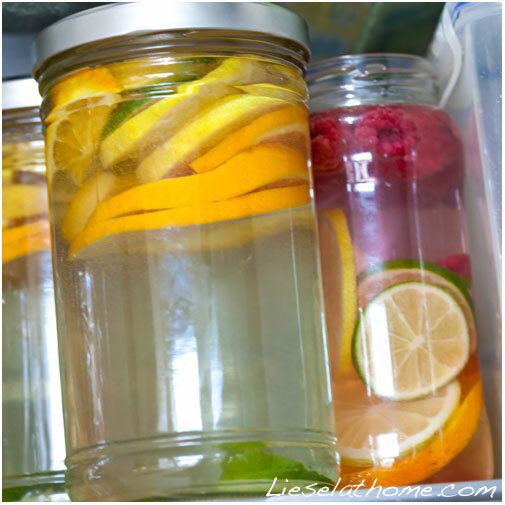 In addition I also made several big jugs with “vitamin water” meaning jugs with slices of lime, lemon and orange, filled up with plain tap water. You can add in frozen raspberries or strawberries too if you want. For some reason this was the most popular drink of the evening! It was a looooong post! Thanks for staying with me! 🙂 Last I want to add, you can cook the most delicious food and serve the most fantastic drinks – it is still the people that makes a party! It was a lovely crowd and I think we all had a really good time. Hopefully I managed to inspire a few when it comes to healthy food choices, just as others inspire me daily.